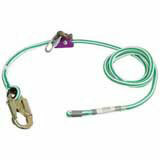 1/2" x 8' Microjuster Lanyard System with Steel Snaps. Constructed of Yale's 16-Strand XTC climbing and that is hand splice by the Yale factory. Equipped with 5M test double locking steel snaps. This complete lanyard system uses Petzl's microjuster (PETB53) which is machined from a solid block of aluminum and features a grooved alloy cam that is not abrasive to the lanyard rope. System includes rated screw link for attachment to your saddle dee.